Image still taken from Experiment 14. Special Containment Procedures: SCP-3040-1 is to be contained in a standard humanoid containment unit. SCP-3040-1 may file for additional furniture items, which are to be reviewed and approved by site personnel. SCP-3040-1 is allowed to move around Site-███ as it pleases, as long as it is accompanied by two Level-2 personnel at all times. SCP-3040-1 is no longer granted wandering privileges. Any requests for SCP-3040 to be amputated are to be ignored by all Foundation personnel. Only objects larger than 20 cm3 are allowed to enter SCP-3040-1's containment unit, in order to prevent the anomalous properties of SCP-3040 from manifesting. This protocol may be suspended for research purposes only. When allowed to roam the Facility, SCP-3040-1 must be presented with an item1 to hold with SCP-3040. Refusal to do so will result in a suspension of her roaming permission. If SCP-3040-1 must leave its containment cell, a 10 cm3 wooden cube is to be held by SCP-3040. This cube cannot have writing or any methods of conveying information on it. SCP-3040 refers to the area where SCP-3040-1's left hand was. SCP-3040 is not visible on the electromagnetic spectrum, nor is it detectable by chemical means. SCP-3040-1 describes it as a "phantom limb," which it senses at all times despite nothing physically being present. It states it has full control over the limb, yet expresses that the limb causes constant discomfort at all times. SCP-3040's anomalous properties manifest once SCP-3040-1 attempts to grasp an object equal to or smaller than 20 cm3 with the missing hand. Upon doing so, the object will vanish entirely, and cannot be recovered unless SCP-3040-1 places the object in the precise location it occupied before, relative to the object's surroundings. No more than one object can be held at a time by SCP-3040. If asked to place a held object elsewhere, SCP-3040-1 will express distress and discomfort, claiming that it cannot release the object. Items that disappear appear in SCP-3040-A. SCP-3040-A is an extradimensional void of unknown volume only accessible by items "held" by SCP-3040. GPS devices do not work within SCP-3040-A, but electronic equipment does function within SCP-3040-A if running on an internal power source. SCP-3040-A is usually empty, however some objects have been observed within video footage. No object persists for more than a fraction of a second, and the Foundation has yet to interact with one of the objects within SCP-3040-A. All objects visible within SCP-3040-A were at one point placed within SCP-3040-A. It is theorized that SCP-3040-A is a localized time anomaly that can have no effect on the outside world, excluding the act of taking the object in. UPDATE: See Addendum 2-A for information on recently observed properties of SCP-3040-A. Interviewer: Doctor May Nathans, medical doctor trained in treating amputees. Foreword: This interview was conducted with SCP-3040-1 after her recovery from the incident, and resulted in the discovery of SCP-3040. Doctor Nathans was assigned to SCP-3040-1 due to her training. Dr. Nathans: Hello Agent Vangarre. Dr. Nathans: How're you feeling? Any lingering pains? SCP-3040-1: Yeah. Still feels like I have my hand, but…I know it's not there. Dr. Nathans: I see. So you feel as if you're experiencing a phantom limb, of sorts? SCP-3040-1: Yes, doc. It's not there, I can't exactly feel an actual limb. Dr. Nathans audibly sighs, before speaking again. Dr. Nathans: Agent, there is no need to be so sarcastic. SCP-3040-1: Sorry. Just…kinda strained from literally losing a hand, y'know? SCP-3040-1: Anyways, why’re you here? I already had a different doc assigned to me. Dr. Nathans: Well, after you reported discomfort stemming from your amputated limb, they referred me to check up on you. Are you sure everything is okay? SCP-3040-1: I'm fine, doc, really. Just some PLS, that's all. That's normal-ish, right? Dr. Nathans: It is, yes. But I need to make sure. Could you show me your arm, please? SCP-3040-1 complies, and lifts her left arm. Dr. Nathans examines it for a few seconds, noting the stump of flesh, and nods. Dr. Nathans: Everything seems fine visually. Dr. Nathans: And it’s just a sort of ache where your hand used to be? SCP-3040-1: An ache, and I can still feel the hand, kinda. Like an afterimage I can move. That’s what PLS is like normally, right? SCP-3040-1 grumbles inaudibly for a few seconds, before Nathans clears her throat. Dr. Nathans: That doesn’t matter. Since you’re experiencing some form of PLS, I’ll be sure to refer you to therapy so you can get back on the job soon. SCP-3040-1: If they don’t let me go ‘cause of my missing hand. Dr. Nathans: It’s very possible you may retain your position. You are right handed, yes? Dr. Nathans: This meeting isn’t about Agent Banner. Dr. Nathans: Now, do you have any questions before I go? SCP-3040-1: I just…wanna try grabbing something. Just to prove to myself my hand isn’t there. Can you hand me that pen? Dr. Nathans: If you wish. Here. Dr. Nathans holds a small, ballpoint pen up, near where SCP-3040-1's hand would have been. A look of concentration crosses her face, before the pen disappears. Both are silent for a few moments, before the pen re-appears and SCP-3040-1 drops her arm. Dr. Nathans: …I need to report this. I'm sorry, Sharlene, but I have to. Closing Statement: SCP-3040-1 remained unresponsive until it was transferred to its containment unit. Its phantom limb was then classified as SCP-3040. Procedure: SCP-3040-1 was instructed to grasp the ballpoint pen with her missing hand. Results: The pen vanished from view once the pen was grasped. Chemical, visual, and physical analysis of the region where the pen had been indicated that the pen was not simply invisible, but no longer present. After the pen was placed down, it reappeared in the identical position and state it was in prior to being lifted. Results: Once again, the pen disappeared, leaving no physical or chemical trace. Upon vanishing, the GPS signal immediately winked out. Once SCP-3040-1 released the pen, the GPS signal reappeared. Subject: A 20 cm3 block of wood, followed by a 15 cm3 block of wood, followed by a 10 cm3 block of wood. Procedure: SCP-3040-1 was instructed to grasp each block of wood sequentially. Results: All three blocks of wood disappeared. Subject: A small GoPro camera. Procedure: The camera was set to record, and SCP-3040-1 was instructed to grasp the camera for twenty seconds, then to place it down. Results: The camera disappeared, much like the previous objects, and appeared once again once SCP-3040-1 released it. The camera was fully functional afterwards. Please see Addendum 1-C for sustained footage. Subject: A mug of hot coffee. Procedure: SCP-3040-1 was instructed to grasp the handle of the mug, and once the object disappeared, was instructed to pour it out before setting it down again. Results: The mug, upon return, was still filled with hot coffee. The volume and temperature of the liquid had not changed at all, despite SCP-3040-1 confirming she tried to pour it out. Note: Due to the loss of the original footage, only the textual documentation written by Dr. Klaus remains. The recording begins with a short clip of SCP-3040-1. It looks directly at the camera, before reaching out to it with the limb that is host to SCP-3040. After contact with SCP-3040 is made, the video cuts to a seemingly endless and empty white expanse. A quiet hum can be heard through the speakers for the entire duration of the remaining clip. After exactly 8.73 seconds, a ballpoint pen identical to the one used in Experiment 1 appears for approximately 0.25 seconds. After 3.61 seconds, a pen identical to the one utilized in Experiment 2 appears. In the last three seconds of the video, the three wooden blocks from Experiment 7 appear sequentially, exactly one second apart. The video cuts abruptly back to SCP-3040-1, which is looking towards Dr. Klaus. The footage ends there. Any electronic recording device within SCP-3040-A will have all files related to SCP-3040-A altered if placed into SCP-3040-A more than once. Alterations to the files only consist of changing all past files to contain all objects recently introduced into the time loop. Importantly, this affects any copies of the files as well, regardless of if they were present on the device at the time of re-introduction or not. SCP-3040-A exists within a persistent minute-long time loop. Any item inserted within SCP-3040-A will appear within all following loops at the precise moment they appeared, and will persist for 0.25 seconds without fail. No observed objects within SCP-3040-A persist for longer. Any and all living organisms will enter a form of stasis. Cells will cease to function temporarily but will not die, and all brain activity ceases as well. Organisms display no ill effects due to this stasis. Any electronic device attached to the organism will continue to function and monitor the organism, however. See Addendum 2-B for experiments relating to the discovery of these traits. The following experiments resulted in the discovery of numerous, previously unknown, traits of SCP-3040-A. Subject: The same camera utilized in Experiment 8. All files removed and uploaded to the Foundation database beforehand. Procedure: SCP-3040-1 was instructed to grasp the camera for twenty seconds, then to place it down. Results: The camera disappeared, much like the previous objects, and appeared once again once SCP-3040-1 released it. The camera was fully functional afterwards. After 8 seconds, a ballpoint pen identical to the one used in Experiment 1 appears for approximately 0.25 seconds. After 3 seconds, a pen identical to the one utilized in Experiment 2 appears. After approximately three seconds, the three wooden blocks from Experiment 7 appear sequentially, exactly one second apart. Then, after exactly 0.5 seconds, the camera utilized in Experiment 83 manifested for 0.25 seconds. The objects utilized in experiments 9-13 also appeared at various time points, until a total of twenty seconds had passed. The video cuts abruptly back to SCP-3040-1, which is glancing off to the side. The footage ends there. Subject: A new GoPro camera of the same make and model used in prior experiments. Procedure: SCP-3040-1 was instructed to grasp the camera for three minutes, then to place it down. Results: Footage from Experiments 8 and 14 was not overwritten. Camera was undamaged and still fully functional. The recording begins with a short clip of SCP-3040-1 much like prior experiments. It looks directly at the camera, before reaching out to it with the limb that is host to SCP-3040. After contact with SCP-3040 is made, the video cuts to SCP-3040-A. A quiet hum can be heard through the speakers for the entire duration of the remaining clip. After 8 seconds, a ballpoint pen identical to the one used in Experiment 1 appears for approximately 0.25 seconds. After 3 seconds, a pen identical to the one utilized in Experiment 2 appears. After approximately three seconds, the three wooden blocks from Experiment 7 appear sequentially, exactly one second apart. Then, after exactly 0.5 seconds, two instances of the camera utilized in Experiment 8 and 14 manifested for 0.25 seconds. Both cameras manifested facing each other, approximately three meters apart. The objects utilized in experiments 9-13 also appeared at various time points. After the mug utilized in Experiment 13 vanished, approximately 20 seconds had passed in the video. 48 seconds passed before the manifestations began, once again stating with the ballpoint pen and ending with the coffee mug utilized in experiment 13. This would repeat once again, before the camera was removed. 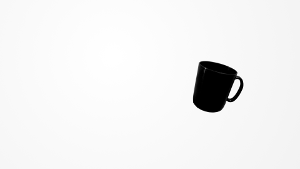 On 6/██/1█, video footage containing the coffee mug utilized in Experiment 13 appeared to change, despite the files being unedited. This coincides with a separate experiment performed by Dr. Klaus, which utilized the same coffee mug without any fluid in it. At approximately 12:35 in Site-██ on 5/██/1█, numerous researchers can be seen around a table. An empty coffee mug4 is seen on the table, adjacent to numerous papers. One researcher reaches for the papers, and inadvertently causes the mug to fall on its side. All adjacent papers appear to stain, as if coffee was poured on them, despite no coffee being visible in the mug. Researchers scramble, and act as if coffee had been spilled despite no liquid being visible on the video feed. At 13:56 on 5/██/1█, the same mug was seen in the hands of Dr. Klaus. He motions as if he is drinking it, yet no liquid is seen within the mug. After this incident, Dr. Klaus asserted that in both situations, the mug had been full of coffee. He claimed that a similar effect had been observed with earlier testing of SCP-3040-A, but it did not affect non-digital objects. Further testing of SCP-3040-A has been suspended to maintain stability and reliability of digital records. SCP-3040 upgraded to “Euclid”. Any requests for amputation of SCP-3040 are to be rejected until further notice. 1. Such as a coffee mug, ballpoint pen, or any item less than 20 cm3. 2. This is the same date that SCP-3040-1 lost its left hand. 3. It is important to note that the camera utilized in Experiment 14 and Experiment 8 were the exact same camera. 4. This mug was confirmed to be the one utilized in Experiment 13.